These are now in the shop, ready for your last-minute gifting spree. 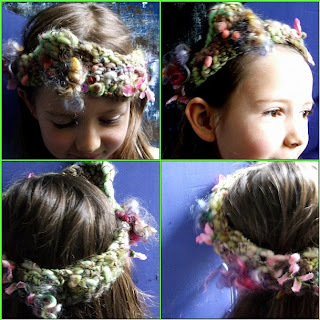 Made using elastic-spun yarn, these versatile neck-accessories are stylish, chic and totally one-of-a-kind. At a bargain introductory priceof $45, they are hot neck attire for all seasons! There is a wool version & a vegan option to suit all next-to-skin-soft persuasions. 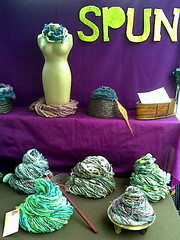 Custom-spun to your desire, you can request the perfect colours for that perfect person in your life. Thinking of a unique Christmas gift? Order before December 1st for international Christmas delivery. A few friends have asked what exactly have i been up to recently.. or under which rock have i strayed.. so, here is a rendition in a nutshell of what exactly i have been up to.. for it seems i fell into a vast black hole of motherdome & other things.. please excuse bullet points, there appears to be quite a bit of news to share! 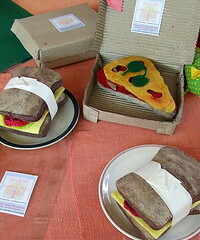 - Took my wares to 2 markets since the Guild Open Day in mid-october.. There was a keen interest in SPUN designs & in my homemade handdyed cd spindles and workshops, which always puts a spring in my step. 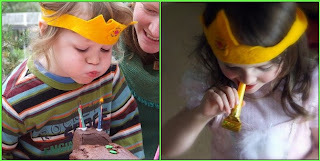 - all 3 kids birthdays in the first week & a-half of November always puts me outta cyber-fiber-land action, and onto mini steam ride-on trains..
felt food (sandwich + pizza slices), dyeing felt & making animal decoration kits. 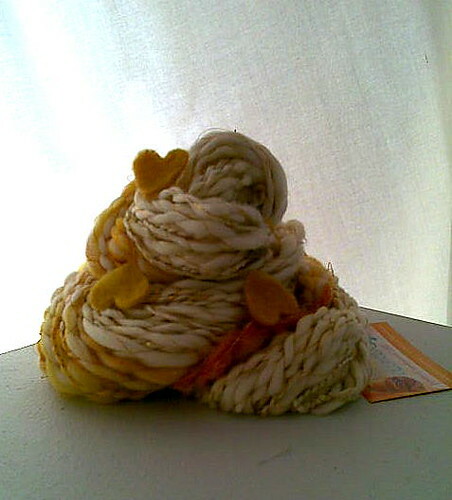 - spinning & knitting 2 pieces for a local Heart-inspired art exhibition for the Love Lawson Festival..
- Goldenheart, handspun yarn was my 2nd entry, as i simply HAD to submit some ART Yarn to the ART exhibition on principle. 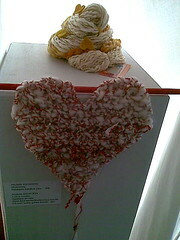 -Heartstring, handspun & handknitted heart hung on a painted knitting needle was my official entry.. which would have been hung against a wall, lest wall-space was lacking. For this piece i was initially going to leave the tail un-fastened with a tag that says "PULL".. hmm.. get it? "pull my heartstring" .. well, dh didnt get it, so i left it off. i think the interactivity would have been drastically underplayed, but i did conjure many wild plans for a whole gallery solo show! It was a personal achievement to see my Art Yarn on a plinth, I have to say it was quite a thrill for this yarn artist.. how does the song go? from little things big things grow..
- dyeing mohair + drying mohair.. still..with the inclement weather it's taken me 3weeks start to finish! have to say i dont mind having it around.. the rich earthy colours are somethin else! -made a market banner & decided it was too dark for markets, so relegated it to the studio. - much wanting for free time in my life to be "just" a mother. 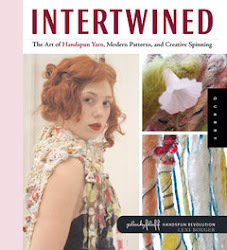 -i am excited to be welcoming the New Year at the Freeform Spinning Workshop..
heres a shout to Aussie spinsistah's!! The Guild workshops are sweetly priced, what better way to have the excuse to spin-play for 2 whole days, and have a weekend in the big city! go forth & grab a space before it's too late.